Wooden nursery door plaque hand made here in the Kenzo Crafts workshop. Once the text has been applied it is all varnished for protection. Drilled holes and threaded with jute to enable this product be hung on the bedroom door or wall. 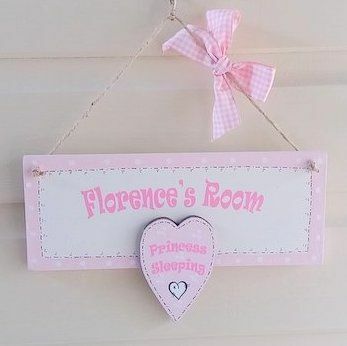 This product is painted in pale pink but if you would like a different colour please email us before payment.